Fans and collectors of comic book hero Tintin can indulge themselves this week at auction platform Catawiki. One of the rarest and most expensive Tintin books in the world will be up for auction there. It’s about a book from 1943 that is known as the alternative edition of the Tintin story ‘L’lle Noire’ (The Black Island). There are only 3 known copies of this book left in the world, and the one in this auction is even rarer. According to Patrick Vranken, comic book expert at Catawiki, it’s not just a comic book. “The album was printed in 1943 on request of illustrator Hergé in a private circulation of only 10 pieces, meant for newspapers who could use it for publication. However, the book in the auction was never sent, but was later used by Hergé (1907-1983) as a working document to prepare a modern version of the original book. The book in the auction is full of corrected drawings and handwritten notes. The book is unique and can be considered an exceptional piece of comic history.” Catawiki expects that the book could bring in as much as €95,000. That would make it the most expensive European comic book ever. In the early 1940s, publisher Casterman asked Hergé to make a colour edition out of the 8 published black-and-white albums. However, because colour print was more expensive and paper was rare due to the Second World War, the number of pages had to be brought down from 140 to 62. 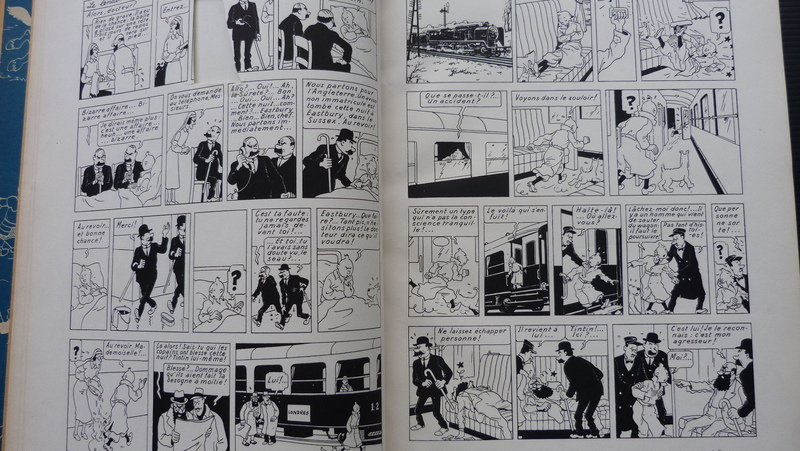 When Hergé finished this, he wanted to send the pages to different foreign newspapers to use them for publication. But because he was afraid that the German occupation would find loose pages suspicious, he had them made into 10 albums with a cover. In 1963, when Hergé wanted to make an improved and modern version of ‘The Black Island’, he used this remaining book as document to make notes for his assistants. Due to this, a unique book came into existence that shows just how much of a perfectionist Hergé was.